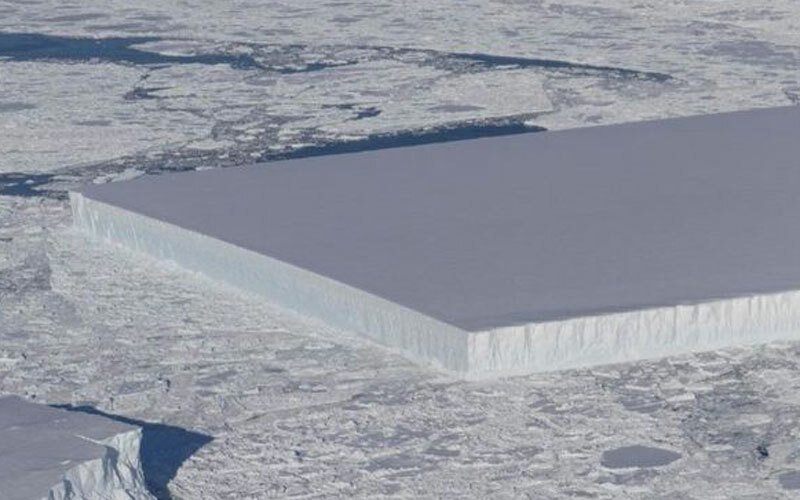 Nasa has released a striking photo of a rectangular iceberg floating in the Weddell Sea off Antarctica. The US space agency said the object's sharp angles and flat surface suggested it had recently broken away from an ice shelf. The edges are still pointed, and have not yet been worn down by the ocean waves. The picture was taken last week by scientists on a Nasa research plane. Such objects are not unknown, however, and even have a name - tabular icebergs. These are flat and long and form by splitting away from the edges of ice shelves. They were often geometrically-shaped as a result, she said. "What makes this one a bit unusual is that it looks almost like a square," she added. This particular 'berg came from the crumbling Larsen C ice shelf on the Antarctic Peninsula. It's difficult to tell exactly how big the iceberg is from the photo, but experts said it was probably more than 1.6km (1 mile) across. And, as with all icebergs, the part visible on the surface comprises just a small fraction of the object's mass - in this case about 10%.